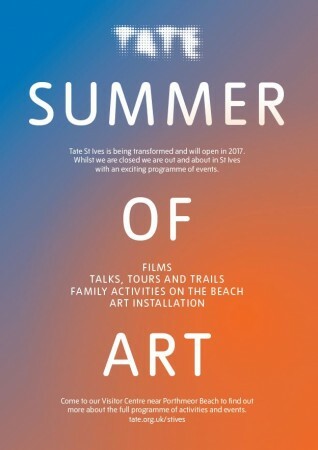 I was invited by Tate St Ives to programme Film Club on 18 August as part of the gallery’s Summer of Art. Titled after the Air Supply hit of 1980, All Out of Love, the selected films draw on the exhaustion and frustration of endings, but also feats of effort: actions driven ‘out of love’. The screening included works by Margaret Salmon, winner of the first Max Mara Art Prize, Turner Prize nominee James Richards, Naomi Frears, collaborators Simon Bayliss and Susie Green with their new work Love Immersion and recent Falmouth University graduate Charlie Fairbairn. Thanks to Naomi and Simon for the invite. I’m showing a new film. There’s food (Dom from CAST so it’ll be good) and a bar. 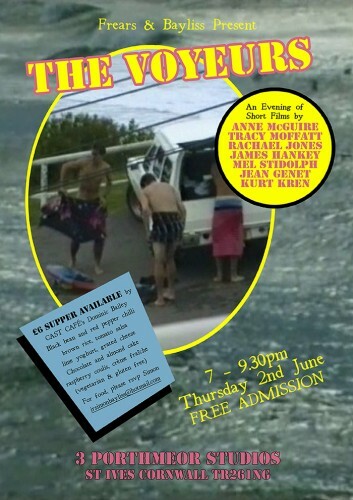 Frears & Bayliss Present: The Voyeurs – An Evening of Short Films by Anne McGuire | Tracy Moffatt | Rachael Jones | James Hankey | Melanie Stidolph | Jean Genet | Kurt Kren. 7 – 9.30pm, Thursday 2nd June. Free Admission. 3 Porthmeor Studios, St Ives Cornwall, TR26 1NG. The Exchange in Penzance warmly hosted SWARM on Saturday 23rd April. 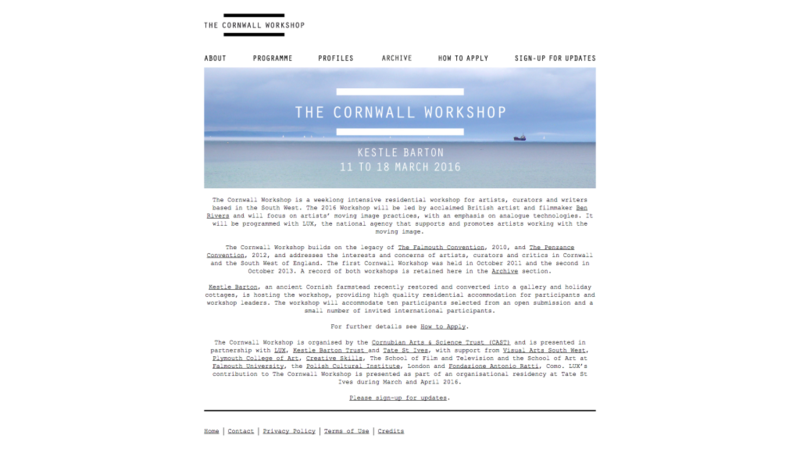 Initiated by KARST and Back Lane West and organised by Field Notes SWARM invited artists and organisations from across the South West to meet and chat. 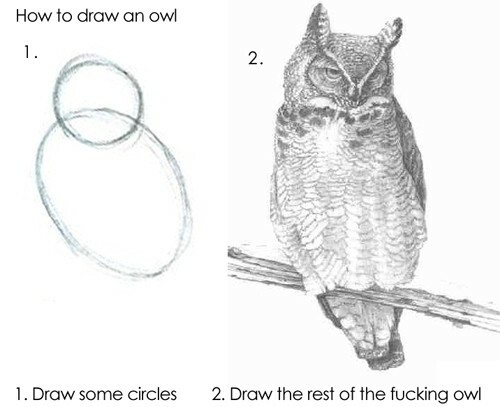 Sharp and funny presentations from Gordon Dalton (featuring the above owl), Network Manager Visual Arts South West, and Lucy Stein and Simon Bayliss (‘Machu Picchu / Pecha Kulcha…’). Simon’s write up on the day is here. Thanks for the invite Field Notes. 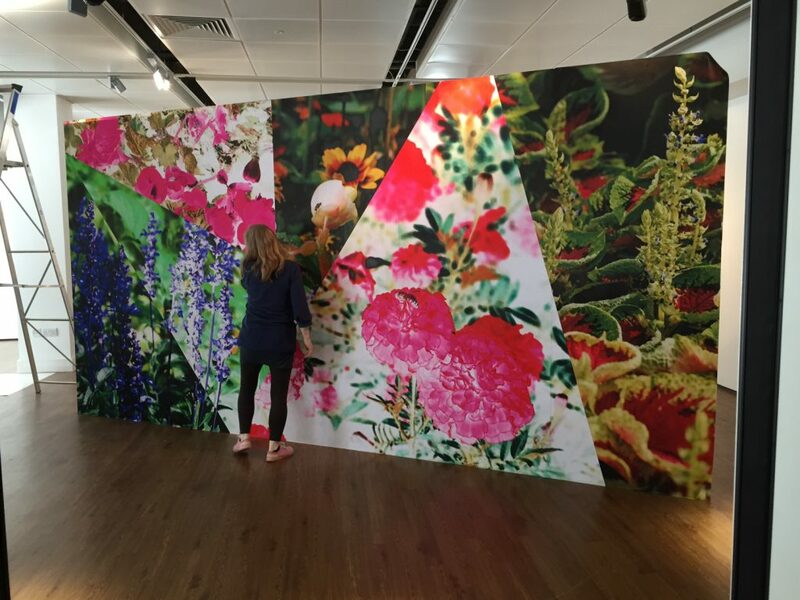 The Photographers’ Gallery, London in collaboration with The Pin Projects, Beijing OCT-LOFT, Shenzhen and with support from the British Council present Work, Rest and Play: British Photography from the 1960s to Today, until 12 July 2015. 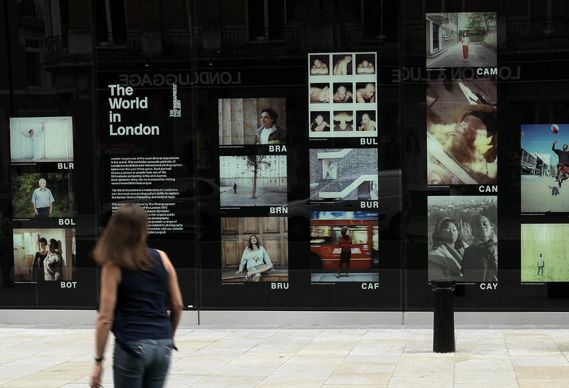 Also on display is The World in London, a major public art project initiated by The Photographers’ Gallery in 2012 to coincide with the London Olympic and Paralympic Games. The project presents 204 photographic portraits of 204 Londoners, each originating from one of the nations competing at the Games. I was one of the 204 commissioned artists and the exhibition includes my portrait of Corina Armel from Mauritius (shutter triggered by Dot the cat). Collaborative practice with Max Catterall since last year, films recently shown as part of PIGDOGMONKEYFESTOS at Airspace Gallery and Exeter Phoenix and as part of open screening at Whitechapel Gallery. 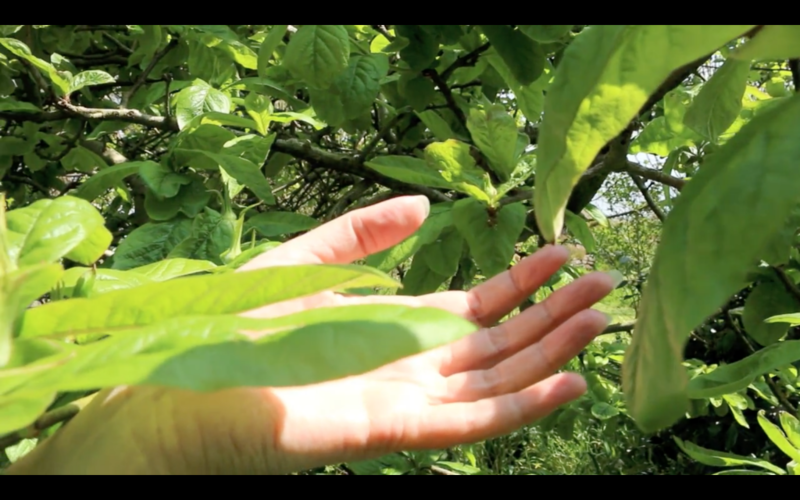 Proposal for new moving image work has been shortlisted for the Exeter Phoenix Artists' Moving Image Commission. Max is based in Bournemouth, and I will shortly be moving to St Ives to take up role as Learning Curator at Tate St Ives, the Commission would be a great chance to continue to develop our practice with the support of a major South West gallery. Filming in the studio this week, working on a new moving image piece for the forthcoming exhibition Eventually Everything Connects at Solent Showcase gallery with Mandy Lee Jandrell. 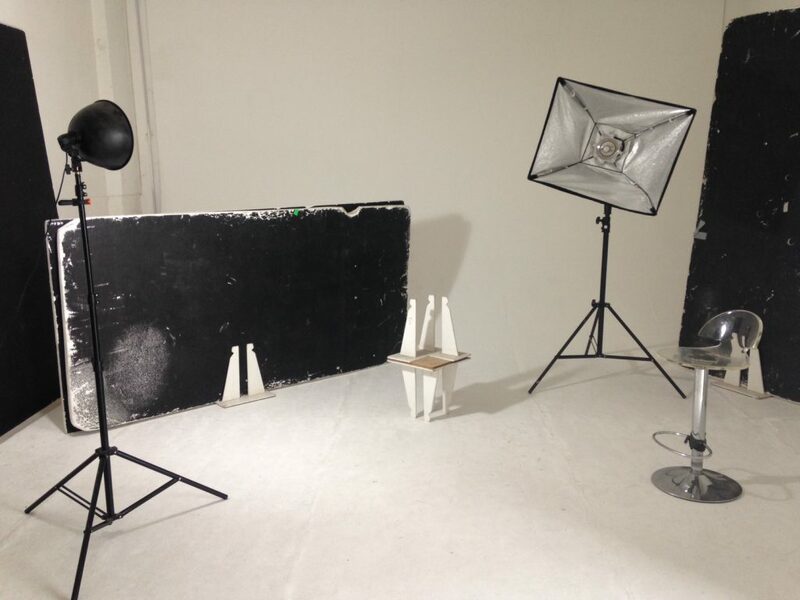 Working title The Assistant, filming in Russian Club studios (thank you Matt Golden) around the idea of the slippage between a directed and accidental moment, conflating the role of Photographer / Assistant and the studio as a site of installation and potential dwelling. Thanks to Nadège Mériau for her assistance and consulting.